Tour dates: 4 April - 23 April 2008. 5. Arrived at the Spring Hotel in Saigon. This a fairly fancy place with a showy reception and A/C in the rooms, and a peculiar mix of French and Vietnamese styles. 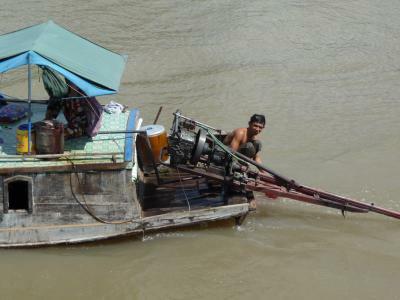 Then the usual chores: a local GSM phone card, some shopping, and arranging a boat tour on the Mekong with the Handmade Travel Agency, and withdrawing millions of dong at an ATM. 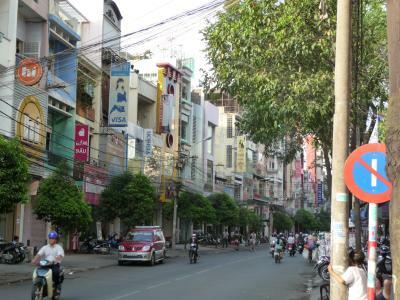 The city of Saigon, sometimes called by its new name, Ho Chi Minh City, has a tropical climate, warm and humid. Sunny weather and clouds alternate. 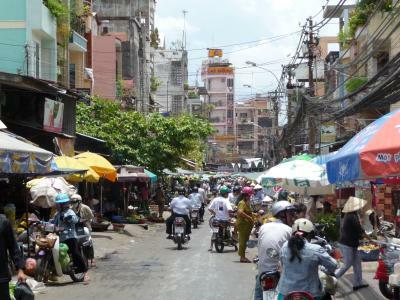 The city is in many ways a typical Asian city - there is all the usual noisy hustle, markets, countless motorcycles that compete for space with cars, women in Vietnamese straw hats carrying a pair of baskets on a pole across their shoulders, and street vendors with their carts. 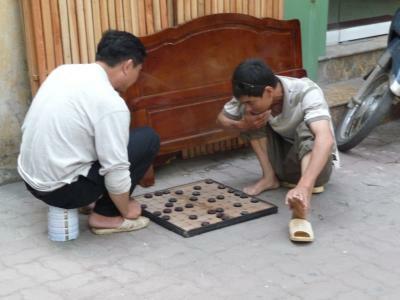 There are people playing board games on the sidewalk, cyclo drivers trying to give you a ride, and the usual incessant honking. But there is something very French about the city; there are wide tree-lined boulevards instead of a twisty maze of alleys, grand French architecture amid the usual drab concrete buildings, and an unusual sense of spaciousness. Vietnam had been a French colony long before the Americans came, and you can still feel it in the large cities. I had dinner at the Restaurant 31 close to the hotel; beef barbeque grilled on a little stove right at the table, with lots of garlic. 6. Breakfast consisted of a beef noodle soup and a fruit platter. As always in tropical countries, the fruit has far more flavor than the stuff we get in Europe. You can actually eat passion fruit here. Dragonfruit sprinkled with lemon juice is great. The Mekong riverside is not great for strolling. There are a few nice piers to watch the traffic on the river, but otherwise it's just industrial. I saw Raketas here - the same Russian hydrofoils I was using in St. Petersburg in Russia, they look like a 1960s dream of a spacecraft. I walked all over town. There are not a lot of tourists here in April, and outside of the central district 1, like across the Thi Nge channel, there are none. The town is much less westernized here, and streets are lined with low buildings with open workshops on the ground floor. 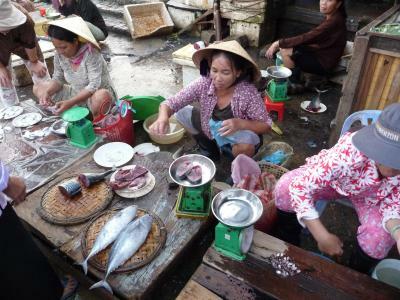 There are also the usual open markets, selling vegetables, fruit, meat, and all sorts of seafood, piled on mats or in buckets. I saw a covered market too, but it smelled rather too strongly for me to explore. Next I went into the independence palace. 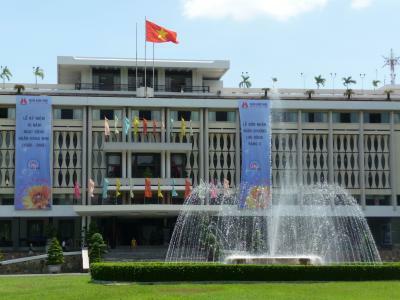 This is a big '70s government building, built for the president of the Republic of Vietnam to replace the one that had been bombed by the president's own army to kill him. I guess his approval ratings were pretty poor. It's all preserved as it was when the Americans fled, right down to the antique army communications gear in the basement. Nearby is the War Remnants Museum, which commemorates the American War (that they call the Vietnam War in the US). Lots of big US military hardware is on display here, tanks, a helicopter, three airplanes, guns, and more. They also show the "tiger cages" where prisoners were held. There are many photographs from US and local sources. Many are gruesome, and it's very evident that torture and waterboarding were not George W. Bush's inventions (he only made them legal). The museum is very matter-of-factly, there is little heroic rhetoric that one might expect. It's quite interesting how Saigon is dealing with Western influence. Much architectural and city planning heritage is evident, and there are the usual Western department stores and chains, from KFC to Bulgari. Vietcong has become Vietcom. But at the same time it is uniquely Vietnamese. It seems that Westernization is not integral to daily life, like it is in Bangkok; it's more like something that has been allowed into the city but it has not become part of daily life. 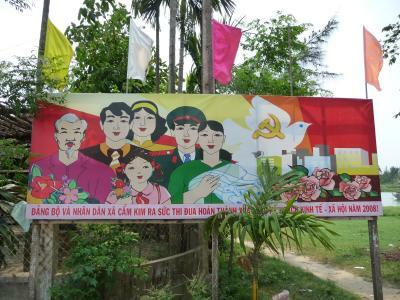 Maybe the reason is that Vietnam still has a socialist government that embraced tourism and foreign investment later than its neighbors, or that Vietnam is much less wealthy than Thailand, but I do hope that they succeed in preserving their own way of life. After lunch, I went to Fanny's for ice cream (never had more fruity passion fruit) and decided to spend the rest of the afternoon in Cholon to see its pagodas. There are no trams or subways in Saigon, and I'd be lost the moment I got on a bus, so I found myself a motorcycle driver. I explained my destination, agreed on the price (three dollars for a twenty-minute ride), and off we went. My driver understood no English, French, or German, and couldn't read maps, and my pronunciation of "Thien Hau Pagoda" doubtlessly left much to be desired. So he took me to a shopping center instead. After all that's what all the tourists want, isn't it? After several more stops, asking people what this Thien Hau thing is and where it might be, we actually found the place. All this sightseeing had cost time, so I got there when it closed. The guard reopened the door and let me in, graceful Asia... Cholon is not especially charming but the pagodas are great. 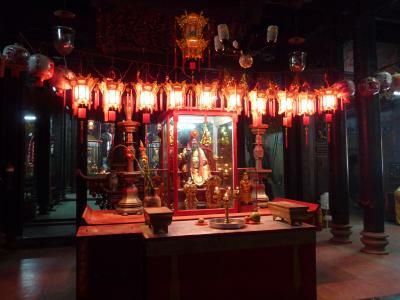 They are nestled between other buildings but are elaborate carved wood structures, with ornaments all over, Chinese writing in gold on red lacquer columns and panels, prayer drums, carved buddhas in golden shrines, red lampions, multicolored flashing LED tubes, and large sand-filled urns with burning incense sticks. I bought and lit a pack for the gods of good timing. If only they didn't light dark rooms with flourescent lights, that was sooo out of fashion five minutes after they were invented... I visited several more pagodas with less strict closing hours. By then the sun had set and it was getting dark quickly, much more quickly than in northern latitudes, so I got another motorcycle. This guy had a much stronger motor and he used it. Most of the other motorcycles on the roads had lights, but none of the bicycles did. Everyone is as punctilious about the traffic laws as James Bond in a chase scene. People ride into oncoming traffic on the wrong side of the road (I especially admired the unlit bicycles that did this), ride into cross traffic or did U-turns, and generally wove around everyone else. The huge roundabouts downtown were especially exciting, much of the time we had traffic coming at us from all directions at once. (I wish I could tell you how big the roundabouts were, but they had no lane markings whatever. Lanes are one of these Western fads that have no use in Asia.) There are traffic lights but they are paid little attention. At some point the honking mob feels that it's been waiting long enough at a red light, assuming it had bothered to stop in the first place, and starts charging into the cross traffic all at once. And the cross traffic stops, more or less. The rides were exhilarating! But if you do this, always follow the golden rule of non-European private transport: agree on the price before taking off, and show them the money you will pay so 15 won't become 50. The corollary is, always carry small bills. I shamelessly abuse restaurants and museums to get change for large bills. It's difficult to find sunscreen here, but they sell whitening milk. Suntans are not fashionable. 8. A car picked me up early in the morning and brought me to Can Tho, a town at a southern major arm of the Mekong in the delta. As we left Saigon, motorcycles were replaced with bicycles, and the chaos of Saigon became one long stretch of small buildings with shops. 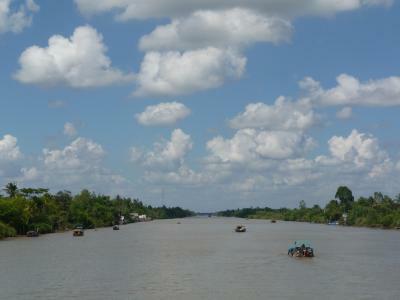 Can Tho is reached by ferry, and after short drive I was brought to our boat. It was a beautiful old wooden boat, the Bassac 2, with four cabins and a lounge on the lower deck, and a sun deck with a cockpit above. 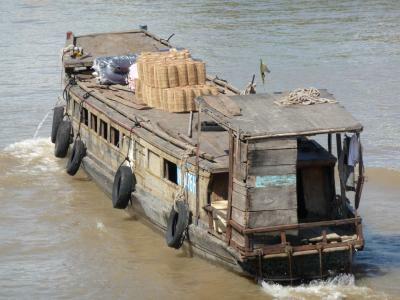 I was greeted with a drink, and shown to my cabin, and shortly after the boat left down the Mighty Mekong, which is enormously wide here. At Tra On the boat turned into a curvy river that connects to another main arm of the Mekong. That river was still wide enough to pass for a major river. The views were stunning. We were passing countless other boats, from large cargo junks to small fishing boats, small boats loaded with bamboo or bananas, rowboats, ferries, and more. Some of these make the word "junk" take on an entirely new meaning. 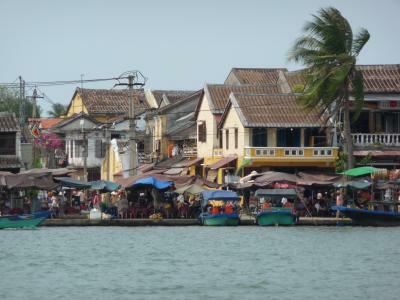 The river banks are lined with palm trees, huge ferns and banana trees, and thatched houses on stilts. Most have a pier, and you can watch people unloading boats. Women with Vietnamese conic hats paddle small boats along the shore. Lunch on the boat was fantastic. Five courses and all of them better than any Vietnamese meal I had before. 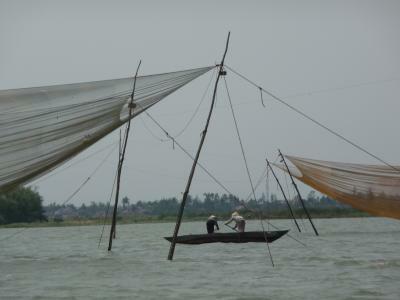 In the afternoon we were taken ashore with the dinghi to visit a village. After walking a while under ferns six meters tall, along rice paddies and lemon tree farms, we were met by a local woman who served lotus trees and fresh pomelos, pineapple, and mango. They grow them there, and they taste like nothing you can find in a supermarket at home. This was a great day. I took 370 pictures. Dinner was just as delicious as lunch, all five courses of it, served on the upper deck under a sky filled with stars. You can see the milky way. There are very few lights on the shore. At some point a huge barge that was obviously lost circled us, shining its searchlight all over the river. At one point the tug boat came very close to us. 8. At six in the morning, the boat continued on its way to Cai Be, our destination. 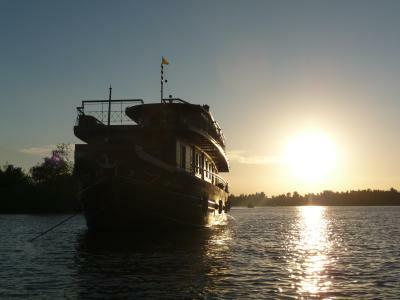 It leisurely drifted along a northern arm of the Mekong in the soft morning sun, passing many other boats from tiny fishing boats t huge barges loaded with gravel. It seems that on each of them was a family going about its work. When our boat finally anchored, a smaller boat took us to a number of sights around Cai Be: first a floating market, then a tourist trap, and finally a Mandarin's house with a big garden. Normally I don't like this sort of thing but they were really nice about it and there was no pressure to buy stuff. The floating market wasn't so much one of those colorful mazes of tiny boats; it was more of a wholesale market where clusters of large boats exchanged large crates. The shore was lined with workshops and houses on stilts, seemingly stacked on top of one another. Everybody was busy with something. My driver from the previous day picked me up in Cai Be and drove me back to Saigon. At first I had planned to spend some time checking out Cai Be, but there isn't much to see there. Back in Saigon I had the driver take me to the train station, after an extended session of gesturing because he spoke only Vietnamese. At the station I put my backpack in storage and took a motorcycle downtown. Another adrenaline ride, except by now I found it perfectly normal to charge obliviously into cross traffic without stopping. So I found time to see the History Museum (that's what it is called) and the neighboring zoo and botanical garden. The museum is mildly interesting; it spans the time from the first humans to the French occupation. They have lots of lovingly built dioramas here where the brave Vietnamese troops inevitably crush the evil invaders. 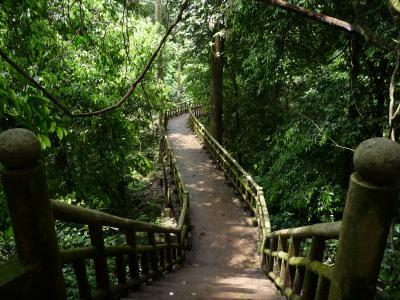 The zoo and botanical garden are beautifully landscaped and a wonderful way to spend a few relaxed hours. The zoo doesn't have large numbers of animals, and there are more walls, fences, and cages than one finds in more modern zoos, but the garden steals the show anyway. The tigers weren't home but the lions were. Finally, after some drinks at a bar at the Mekong, watching the sun go down, I had a baguette at a fancy French restaurant and headed back to the station. I had seen a movie on this, but seeing it is another matter: while in the city, the train tracks wind their way through a canyon between city buildings that is so narrow that in some places people could reach out their windows and touch the train. In most places the gap is two or three meters wide; open shopfronts face the tracks. The train honks all the time to warn people to step off the tracks. And just as I write this, the train grinds to an emergency halt, people run to a spot under my window, and pull a small girl out from underneath the train, and lay her on the ground. (I am in the second car.) I cannot see what has happened, but she seems alive, and has a bloody arm. The conductor later confirms this, she is alive. Ten minutes later the train continues, slower than before. 9. The train ride is fairly comfortable, with good ear plugs and eye shades. Timing is suboptimal though, it arrives in Nha Trang at 4:48. I took a cab to the hotel I had reserved the day before, the Perfume Grass Inn, but when I got there it was still dark and the hotel was closed. So I walked half a block and watched the sunrise over the South China Sea. All around me people were doing calisthenics or jogging. The Perfume Grass Inn isn't as great as the Lonely Planet made it sound, but bright and spacious. After a shower I started walking about town, planning to see a large buddha statue, but I quickly found the town boring. Not much to see here besides the beach. So I went back to the hotel and asked for a boat tour, and they arranged a pickup in ten minutes. Boat tours are very popular. The boats are old wooden diesel boats with benches along the side and in the middle, and a sun deck on top. We left the small harbor with California Dreaming on the boat's sound system. We made a number of stops. The first was a little coral reef at one of the numerous little islands. They had masks and snorkels, and we went swimming for an hour. The corals are nice enough, but they don't have nearly as many fish here as you see in Hawaii or Thailand. They served lunch on the boat. They folded the central benches to form a large table, and put dozens of plates with vegetables, meats, fish, and spring rolls on it, to the sounds of Hotel California and Alphaville. Well, it beats the music blaring from the speakers of this morning's taxi, which I can only describe as Klingon opera. Later, though, they brought out some drums and staged an appallingly undignified Karaoke session. The remaining stops were less exciting: a small island where we could do jet skiing or paragliding, but the interior of the island itself was not accessible. You pay to get on the island, you pay if you want a chair, you pay for jet skis... Most of the fees are very small but I wonder why they risk making tourists feel ripped off by asking for money at every step. Finally we made a stop at an aquarium on another island but by then I'd had enough and just sat at the shore and looked out at the sea. I was back at the hotel and decided that one of these tours is enough and went to the bus station. The town is quite spread out so I used the most normal mode of transportation in the world, the back of a motorcycle. Tickets could only be bought an hour before the bus leaves, but I got a reservation. (Not that one is needed as it turned out.) I still wanted to see that buddha so I agreed with another motorcyclist to drive me around for a couple of hours. The buddha is at the top of a hill. It's huge, gleaming white, and looks out over the town. A cemetary with long marble racks of niches, each with a little holder for incense sticks, surrounds it. The buddha is reached by a a long winding stone stairway, starting at the side of a temple with flaring roofs at the base of the hill. It all looks exactly like a Buddhist temple is supposed to look like. There are the usual postcard vendors at the bottom, claiming to be students at the temple, supporting it because there is no donation box. Yeah, right, that would be the first one. 10. 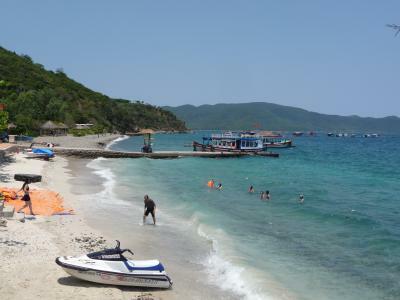 The next morning I caught the bus to Qui Nhon at 6:45, and arrived at 11:00 after numerous stops. There are many nice views of hills, rice paddies, and the sea. In Qui Nhon I first bought a ticket to Hoi An for the next morning. That leg of my trip was much longer than I liked but there is no convenient place to stay overnight between Qui Nhon and Hoi An. Then I checked into the hotel I had reserved the night before, the Hai Yen. They speak no English there so this took a while - they said they had no rooms even though the hotel seemed empty, and the first room they showed me after that was taken care of was too dark so after some discussion I got a nicer one. Qui Nhon evidently doesn't see many tourists. Many people call out "hello", but noone comes running to sell something. They haven't even gotten used to overcharging tourists yet - ask a street vendor twice for the price of oranges, and the price doubles. The old town around the hotel feels much more inviting than Nha Trang. Narrow tree-lined streets, little traffic, and everybody is friendly. There are two pagodas one block away from the hotel. But the beachfront street is freaky - extremely wide, and all the houses along it are in ruins. Most are just rubble, some walls remaining standing, and a handful of small houses that have been patched up again. The houses along the next street behind the coast are perfectly intact. All the time, a very strong wind was blowing along the beach, I felt sandblasted. 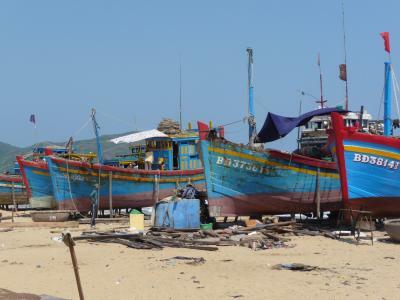 Hundreds of boats anchor a short distance out at sea, and there are many big round baskets on the beach that are used as one-man boats here. But two kilometers south the rubble ends. 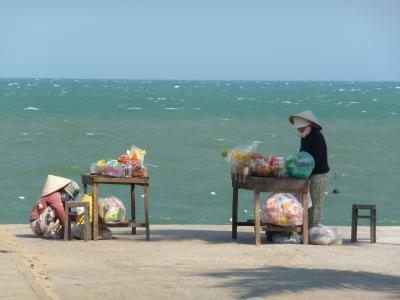 The beachfront turns into a well-kept park with grass, trees, sculpted bushes, benches, and women selling snacks. 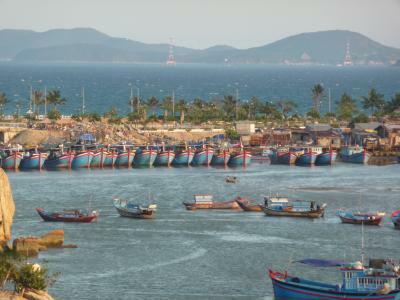 This is the tourist section of Qui Nhon, with several large concrete hotels. Except I didn't see any tourists here either. 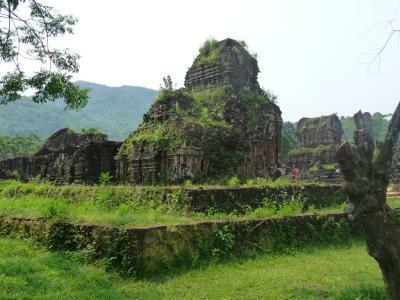 I also walked up north to see the ruins of a pair of Cham temple towers. Here, too, are train tracks running through the middle of an alley, although it's wider than the one in Saigon and this is not a major train line. Again I didn't see another tourist the whole afternoon. Lots of people, especially children, called out "hello" to me, and they really meant it as a friendly greeting and not the first shot in a battle for my money. The Cham towers are interesting, but the place is very small and crowded by city buildings. And for the first time I couldn't find a motorcycle and had to walk back. 11. The bus ride to Hoi An takes six and a half hours. Our driver made it in five. His passing maneuvers, cutting back into our lane just before oncoming traffic, made even the Vietnamese on the bus stare ahead with a glazed look on their faces. Sometimes our brave little rocketeer mistimed and forced oncoming traffic onto the shoulder. He was leaning on the horn most of the time to shoo motorcycles and cyclists aside. I saw two overturned trucks on the side during that ride; not our fault though. The bus had room for 15 passengers but at one time there were 24 passengers squeezed into the four seat rows, even the driver was sharing the front with three others. I stayed in the middle at the exit so I could stretch my legs; the seat spacing was designed for much shorter people than me. I was watching the approach to Hoi An on my GPS unit and asked to be dropped off at the right time. I would have missed it otherwise, and the bus doesn't actually go through town. A fairly long motorcycle ride later I was in my hotel, the An Quy. (This was the first time my first choice had been fully booked when I called the evening before, but then it was a weekend.) The An Quy is great; elegant, bright, clean, free Internet. One house rule says "stinking things are not allowed in the hotel". Hoi An is a wonderfully relaxed town. It is very walkable, and, I admit it, the availability of tourist facilities makes things easier. In Qui Nhon it was difficult to find a good restaurant that doesn't serve food from buckets, but here there is a huge selection. 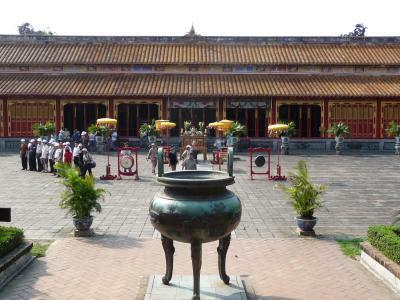 Even better, Hoi An is a historic town; it is one of the few towns that was not destroyed in the American War. What a shame to think what all the other towns must have been like before the US decided to bring freedom and democracy and bombs and massacres and Agent Orange to Vietnam. The downside is the touts - "hello sir come buy something". Even so, My Son is a fascinating memento to the lost Cham culture. Many towers are overgrown, and the setting in the dense forest with the mountains as a backdrop made this a great experience not to be missed. 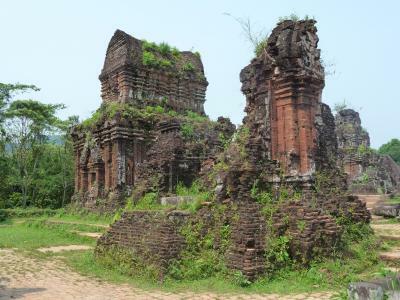 The Vietnamese are trying to restore damaged temples where they can. I had booked the boat option too. It was one of those ill-conceived tours where everything apart from the bus ride is extra: the boat, temple admission, even refreshments on the boat. 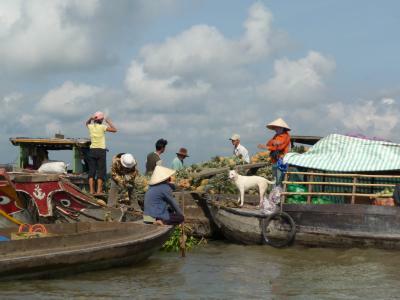 The boat ride covers only the last six km to Hoi An on the Thu Bon river, and the scenery wasn't anywhere near as interesting as in the Mekong delta. The boat was listing heavily to the left side, and made a stop at Cam Kim island to see wood carving workshops. I walked the river banks instead. I normally don't like these tourist deals, but it was much easier than arranging my own transportation, and once at the temple site it was easy to lose the group. 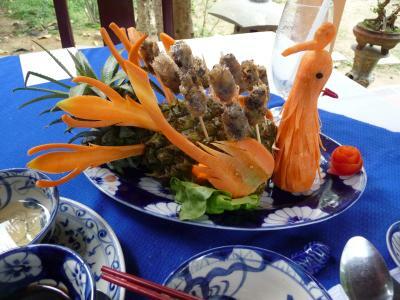 Back in Hoi An, I had another great lunch, and went on the museum circuit. The city sells a ticket that allows you to choose five out of 15 available places with complicated rules. 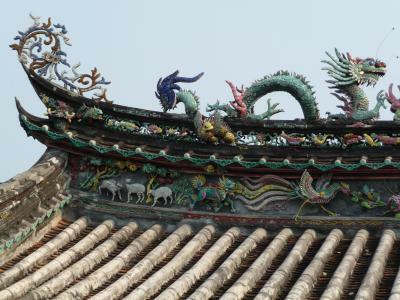 I chose the Chaozhou assembly hall, the Quan Cong temple, the ceramics museum (nice house but few exhibits), and the Tran Family Chapel, the house of a Chinese Mandarin ambassador where a guide leads visitors around the house and explains architectural designs. A few other pagodas are open for free. The five-out-of-fifteen deal makes it impossible to just pick interesting places freely, but the places I did see were impressive and very well maintained. 13. The bus to Hu� was a real bus with air conditioning, not a minibus like the one that got me here. It's only three and a half hours from Hoi An to Hu�. Unfortunately the bus and train now use a 6.5 km long tunnel rather than the scenic, although foggy, old route over the hills. The guide warned that it's a weather divide and it would be colder in the north, but I could feel no difference. For a short while the bus was driving alongside the Reunification Express train I had used to leave Saigon. I first went to my hotel in Hu�, the Hu� Heritage Hotel. This hotel tries so very hard to be a first-class hotel and still looks like someone put some better furniture into a communist government guesthouse. My room was nice enough with hardwood floors, nice furniture, and marble tiles in the bathroom, although the interior design was extremely uninspired - they basically line up all the stuff along the bare walls. The reception area is spacious, but has the same problem, and the faded and stained red carpets look like a leftover from pre-tourism days. There is a detailed list of all pieces of furniture and accessories in the room, so if you make off with a sink or the curtains they'll know. After getting my train tickets for the next day, I went to Hu�'s Citadel. 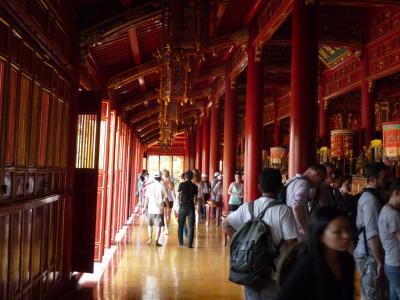 This is a large "forbidden city" where the emperor held court. Unfortunately only a few buildings remain, but they are very well restored and give a good impression of the glory of imperial times. There is lacquer and gold everywhere, and especially the main gate building makes one feel like having stepped into another time. More restoration work is in progress, and it seems that a few buildings are reconstructed basically from scratch. The whole Citadel area is very relaxing and can be walked at leisure. After four hours of touring the grounds, taking care not to miss the gems hidden in the corners of the complex, I went out and had a late lunch at the Y Thao Garden. It seems that the emperor Tu Duc was a fussy eater so you couldn't just dump a meat loaf and chopsticks on his plate, it had to be lots of little dishes. That started a fad and they still do it that way in Hu�. I had a great eight-course lunch. The northern part of Hu�, which is where the Citadel and the restaurant is, is the nice part. Little traffic, mostly residential, you can watch the life of people. Here, too, people greet you just because they are friendly and curious. Few tourists seem to venture past the Citadel; their loss. The downside is that it's very difficult to find a motorcycle to get back, I had to walk back to the Citadel where they wait. I concluded the day in the hotel's rooftop swimming pool, which was the reason I chose the hotel. 14. Again the hotel tries hard to live up to international standards with its breakfast buffet, right down to the artificial orange juice, but just can't seem to pull it off. I walked some time in the southern part of town, but it's just loud and there aren't any interesting things here. So I got a motorcycle to take me to the Thien Mu pagoda some distance up the Perfume river. The pagoda is one of Vietnam's most well-known landmarks, and the tall tower with its seven stories at the entrance is very distinctive. There are several other buildings with well-preserved exhibits behind. From the grounds there are great views over the Perfume River. Back in town, I also checked out the large market on the Citadel side of the river. It looks exactly like an Asian market is supposed to look like: a maze of narrow aisles, with booths and women spreading their wares on the ground. A patchwork of low-hanging tarp roofs protects people from the sun. In the middle is a two-floor covered market building with tiny booths and benches. Anything is available here: fruit, meat, dried fish, toiletries, cloth, shirts, electronics, spices, more things than I can enumerate. The whole huge place is so crowded that people use every available space to display their wares. Some booths are so chaotic that they seem to have more things draped on the tables and walls than my camera has pixels. I had a Vietnamese lunch near the hotel, and a great fruit shake at the Phuong Nam Cafe (which is little more than a few tables on Tran Cao Van street). 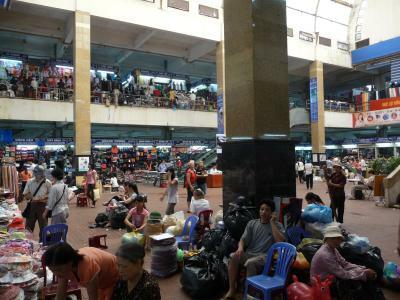 Then it was time to get on the Reunification Express Train to Nimh Binh. I chose the afternoon train because it stops in Ninh Binh (the faster ones don't) and arrives at a convenient time in the morning, after sunrise. It does take 15 hours, European fast trains go at least five times faster than this "express". But it's certainly more entertaining. I shared the sleeper cabin with a Vietnamese family. Only one guy spoke a few words of English, but he wanted to know everything. So I pulled out my Archos and showed him hundreds of pictures from Berlin and a documentary on bicycling in China, and in the end he asked for Hotel California which faintly blared from the Archos' tiny speaker. (I also carried an iPod but it had died on the first day, and anyway it has no speakers.) Sixteen hours sounds like a long time but when you are having fun, and can watch the Vietnamese countryside pass by, the hours pass quickly. Later the train speakers started playing Chinese music. 15. 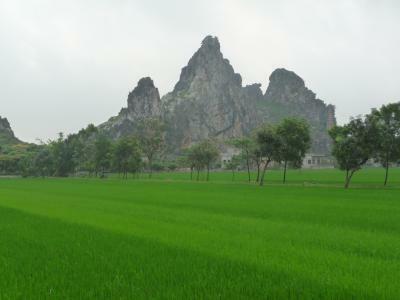 In Ninh Binh I stayed at the Than Thuy's New Hotel. They arranged a motorcycle to a number of local sights. First was the Bai Dinh Pagoda, which is still under construction but already gets large numbers of visitors. My motorcycle driver had gone there for his wedding. There are two humongous buildings, with buddha statues weighing up to 500 tons. There is still lots of scaffolding. Many Vietnamese tourists called out hello to me, wanted to shake hands, touch my arm, have their photo taken with me, coerced their children to shake my hand - strange, I felt like an exotic trophy. They don't get a lot of Europeans here. Stop number two was the Hoa Lu Temple, packed with people but the real star is the countryside around it. There are countless little craggy sugarcone-shaped hills jutting almost vertically from the rice paddies. At the Hoa Lu temple, there is a long steep stone stairway leading near the top of the hill with a wonderful view. My motorcycle driver knew all the most scenic little roads through the paddies and small villages, and avoided busy roads completely. 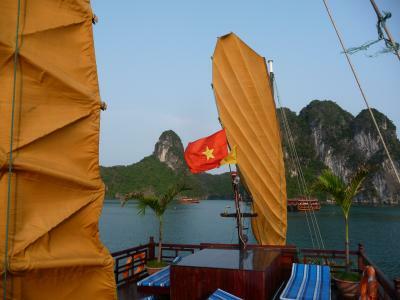 The Than Thuy's New Hotel is known for arranging safe and scenic day tours. 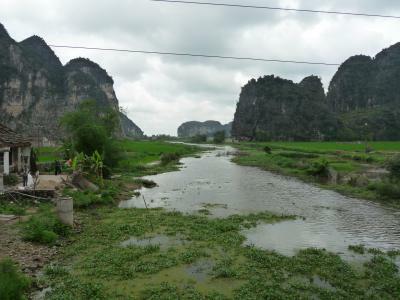 These two were just prologues to the final stop, Tam Coc. 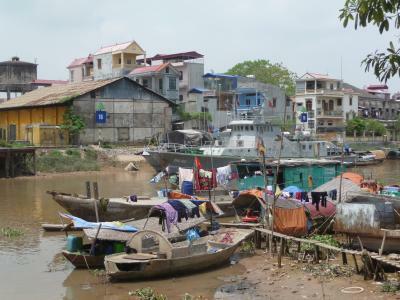 At the Ngo Dong river, many dozens of small rowboats wait for tourists, mostly Vietnamese. A flotilla of these boats slowly moves down the river as it winds its way between those steep sugarcone hills. At three points the river moves through grottos, apparently formed by water erosion when the water level was a few meters higher than it is today. Consequently the grottos are claustrophobically low but wide, and quite long and dark. You can reach up and touch the ceiling in most places. 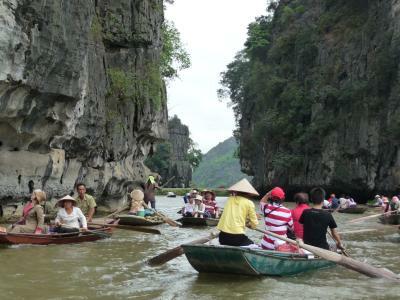 People are working in the small rice paddies in the narrow space between the river and the sheer rock faces. Gliding through this surreal landscape was fantastic. Except for the touts of course. After the third grotto all the boats turn around, and this is where the snack boats wait to pounce on the tourists. Saying no thanks a few times and then turning away got rid of them surprisingly easily, and it worked for my own rowers when they started to unpack their box with embroideries. I spent the rest of the evening wandering about downtown Ninh Binh. 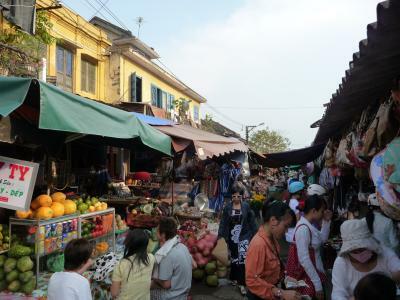 They have the usual open market around a market hall. In the hall they appear to have a section for candy, dried fish, and rusty bolts. Upstairs is clothing only. The hall isn't even finished and it already has the trademark dilapidated look and dim lighting that you find all over Asia. On the other bank of the river there are lots of little stalls for food, but there are also barbers and several dentists, who have their tools spread out on a little box. Customers sit on a dentist's chair, and the dentist has a cheap plastic version of a miner's flashlight on his head and pokes around in your mouth. 16. 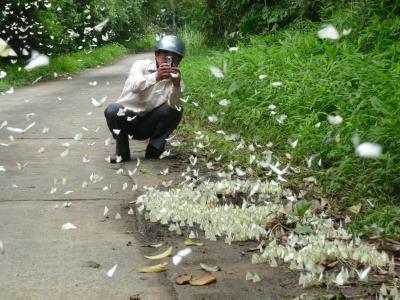 I went on a tour to the Cuc Phuong national park the next day, with the same motorcycle driver. When we left in the morning, he made sure I had glasses for the butterflies. I didn't understand what he meant. The ride is fairly long, almost two hours, but just like the day before he knew incredibly scenic side roads through villages and rice paddies. We stopped at pineapple and lemon fields too, and watched farmers plow the fields with buffalos. At the park entrance they have a monkey enclosure where they protect the dwindling population by raising monkeys, and eventually release them into the wild. We got to see a number of monkeys in cages and in an open but fenced forest. Then we went into the park itself. They have a cave near the entrance. They rent out flashlights at the entrance but I brought my own, and much brighter one. The cave is absolutely pitch dark inside, and I had to climb over slippery rocks and climb a long metal ladder bolted to a cliff inside the cave. In some places the cave is really low, less than 1.5m. There are few safety features here, no lights and no directions. If your lamp were to fail, you can get seriously lost here. At the end of the road, there is a kind of nature trail. The terrain is quite hilly and although it's only six kilometers long, I was constantly climbing endless roughly hewn rock stairs, or sliding down mud trails. The ground was quite wet even though it hadn't rained. The forest is very dense and unmanaged; it's a tangle of huge trees, ferns, and banana trees, with many fallen trees and lots of underbrush. A jungle. They have a few more attractions like a thousand-year old tree and another cave (more climbing) but the real attraction here is the forest. Back at the hotel I put the butterfly movie I had made on the hotel computer, for my driver. When plugging in the card it hid the dcim folder and installed autorun.inf and dcim.exe, and when I plugged it in a second time it hid dcim.exe too and installed dcim.exe.exe. This was on a recent Windows XP. Pathetic. The command line worked. 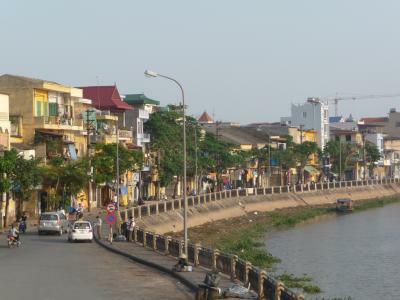 The city of Haiphong is nothing to write home about. It's clean, fairly modern and affluent, and has no sights. The river banks are taken up by wharves and seemingly abandoned boats. At least I think nobody would risk traveling in rust buckets like these. I had lunch at the Van Tue restaurant, and the fish was quite good but not exceptional. But the homemade ice cream in the little place next to the BKK restaurant on Minh Khai street is brilliant, it's hard to get better icecream in Italy. There is a major supermarket across the street - it seems that no matter where I go, Nivea, Ehrmann, Bahlsen, Nestle, la vache qui rit, Nokia, Heineken, and Coca Cola are already there. 18. The minibus ride to Halong City was uneventful until a guy with a pack of cards entered, sat down in the middle, and started a card game that seemed to focus on keeping track of which card went where. Soon everybody was hotly engaged, shouting, waving wads of money, making sure the cards are clean and he had no cards hidden in his sleeve. Then money exchanged hands and the guy got off. 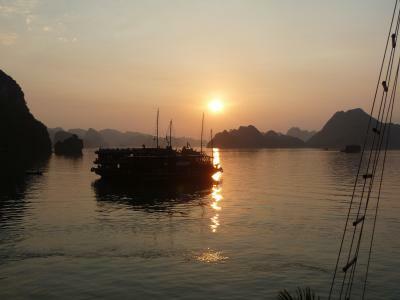 Halong City, at least what I saw of it, is not worth a second look, it's all highrise tourist hotels and entertainment. 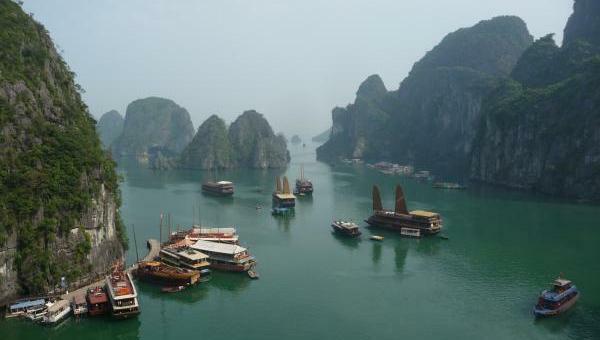 I got picked up here for the Halong Bay cruise I had booked a few days earlier. And I had saved no expenses - US$ 235 buys a single cabin for three days and two nights on a top-of-the-line luxury junk, the Classic Sails. It's all dark wood; marble bathroom, a cabin deck, a dining deck, and a sun deck, beautifully furnished and with a crew of nine for up to fourteen passengers, although we were only six. When arriving on board, we were greeted with refreshments. Everybody is really friendly and helpful, and they speak English. A seven-course lunch followed, but I was distracted. 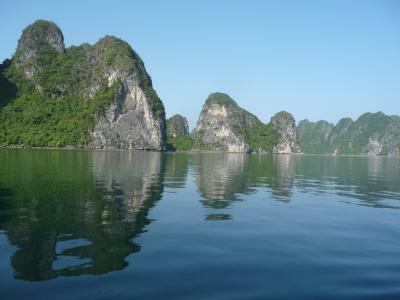 Halong Bay is at the northern edge of the Gulf of Tonkin, itself part of the South China Sea. It's a beautiful blue and emerald sea, from which hundreds of sugarcone islands rise, with steep rock sides and overgrown with trees. Their foundations have been eroded and have numerous little caves and fissures, sometimes going all the way to the other side. The base is overgrown with calcified mussels. Some stand alone, looking like tall mushrooms, and others coalesce into islands. A little like Ninh Binh, except this was the sea, and on a much grander scale. The weather was perfect, and the beauty of quietly gliding on a junk among these islands was just stunning. I have traveled the world widely, and this is one of the most beautiful places I have ever seen. I am not poet enough to adequately describe the feeling. The junk has a tender boat, which brought us to some interesting sights on the islands. 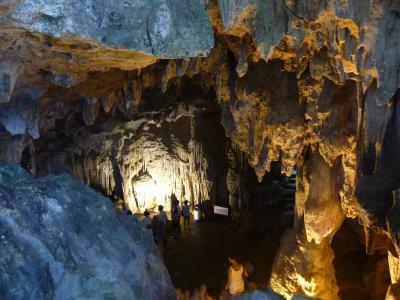 The Dong Me Kung island has a grotto with a (well-lit this time) dense maze of stalactites, through which one can climb to the top of the hill. 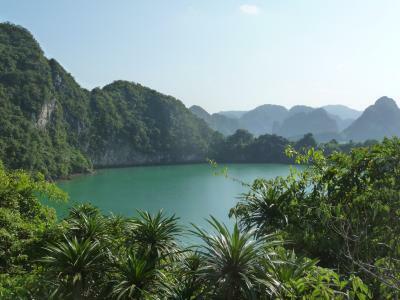 A lake can be seen from here that is said to be the eye of the dragon, which according to legend has created Halong Bay. Another tender trip took us to an island with a beach where we could swim. I used a kayak to return to our junk. It was fantastic to glide among the sugarcone mountains, and a few other junks. As I write this, the sundown paints the sky a deep orange and outlines the craggy skyline, and several other old junks that have chosen this place to stay overnight. It's a full moon night, and the crew is preparing dinner. I will sleep well tonight. Later we watched a big typhoon approach Halong Bay on the boat's big flatscreen TV, and then veer off to China. 19. 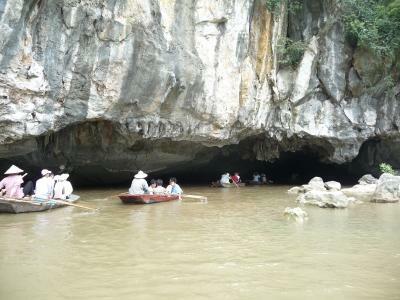 In the morning we saw the enormous Hang Sung Sot grotto, the largest of all. It's a sequence of huge halls, you could park a lot of jumbo jets here. Intricate patterns of stalactites are everywhere, often grown together to look like palisades. The cave is very effectively lit with colored lights, and there is a smooth footpath. It's cool but very humid, much more than outside, but there is no water on the ground. The cave opens up to a viewpoint with a fantastic view over the bay; I took the picture at the top of this page there. 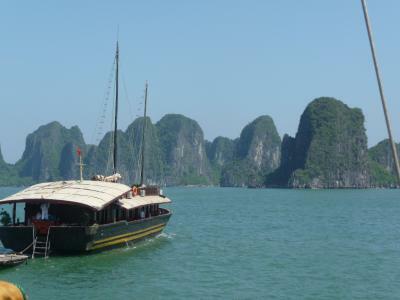 The guests who had booked a one night tour left us, and I was taken on a tender to a floating village in Halong Bay. 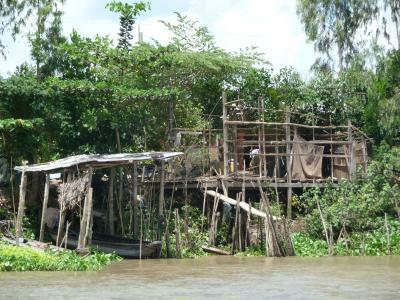 People live on small wooden houseboats, often lashed together. The only industry here is fishing. The mountains are too steep to enter, let alone farm. I am told that people here stay on their boats all their lives and do not even visit a city. They do have a large school houseboat though, and they have TV. 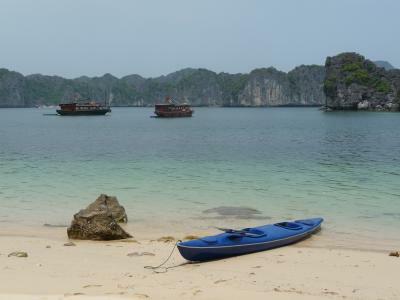 We parked the tender in the middle of the little bay, surrounded by steep mountains, and one of the boat crew and I paddled around the village and several nearby islands with kayaks. The we moved the tender to another little bay where several mountain islands had tiny beaches, all empty. We chose one, paddled there, and I swam and inspected the islands from the water level. The we crossed over to another, bigger island, and I swam for more than an hour to another island, around a group of impossible steep and tall rock needles, and back. The subtropical sea is warm and beautiful; glowing emerald water is more than a figure of speech here. When we got back to our junk the other guests were exploring beaches elsewhere, so I talked to the captain for a while. He challenged me to jump off the boat into the sea, and soon half the crew was in the water. Now I again sit on the sun deck, watch the sunset over the bay, and wait for dinner. A falcon is circling over us. 20. The next morning began with an overcast sky, and we didn't see much sun all day. 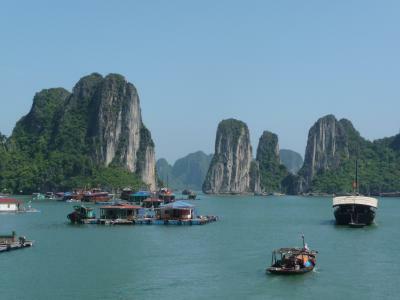 Halong Bay is still a magical place when the sky is gray, but it does lose some of its jaw-dropping beauty. 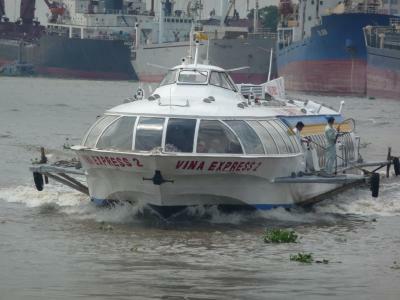 After breakfast, the boat started to make its way back to Halong City, where we got on a bus that brought us to Hanoi. I arrived at the Metropole at 15:00. The Hanoi Metropole is one of the best hotels in the world, and I had reserved a deluxe room in the historical wing. When the porters open the doors, you step into another world. Gone is the honking motorcycle mob; a receptionist waits for you at the door, confirms your name, and finishes the formalities in less than a minute. I was shown to my room, which could have been at any luxury hotel in Paris. High ceilings, dark hardwood floors that creak as they should in an old building, long French drapes, beautiful furniture and a chaiselongue, a fruit bowl, and a huge bed. Downstairs are wonderful restaurants and a pool in a beautiful garden. And like only in the very best hotels, WLAN costs extra. Since it was getting late, I walked for a couple hours about the old quarter at the city lake, one block from the hotel, and saw the one-pillar pagoda and the Ho Chi Minh mausoleum (from the outside, it had already closed). 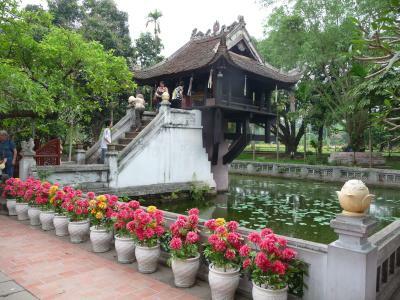 The one-pillar pagoda is built on a single stone pillar in the middle of a pond, and is held by wooden beams. It's quite small but has a massive white staircase leading up to the shrine inside, which destroys some of the effect. The pagoda was built in the 11th century, destroyed by the French as a parting gift, and rebuilt. It's shown on Vietnamese coins. 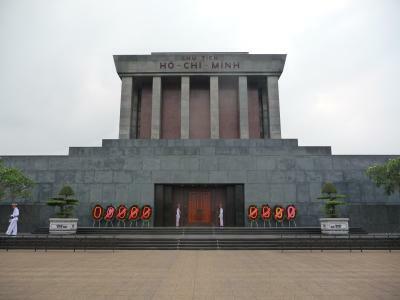 Ho Chi Minh actually never wanted a mausoleum but after he was safely dead, they built this massive imposing monument for him anyway. As I stood outside, [caution Monty Python reference] the Ministry of Silly Walks staged a guard change. It must be rather uncomfortable to throw up your legs like that. When the guards were safely out of range of the cameras, they resumed a more normal gait. Back at the Metropole, I was asking the concierge for travel advice. The answer was straightforward. "Where would you suggest should I go tomorrow?" "You go to Perfume Pagoda." "You go shopping when you return from Perfume Pagoda." 21. This is my last day, and it's going to be a lazy one. No Perfume Pagodas, just walking about town. The Lonely Planet suggests an interesting walking tour in the old quarter, and I roughly followed it with many detours. 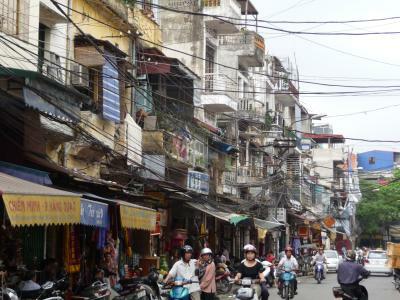 Hanoi's old town is much more organized than other downtowns: there are streets where all shops are toy shops, another street has only welders, in a third you get only spices, and so on. They have 36 such specialized shopping streets. Downtown is fairly crowded with motorcycles. There is a large lake, the Hoan Kiem lake, in the south of the old quarter, where one can watch people performing Tai Chi in the morning. 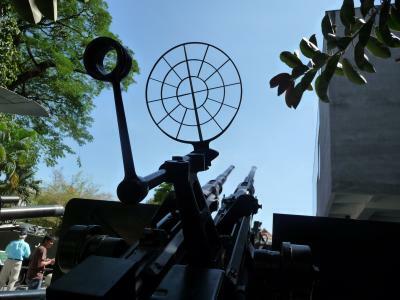 To the west of the old quarter is the Hanoi Citadel quarter, which is a military area and closed to visitors. It's fun to watch people on the street, working, selling, eating, or drinking. It's very colorful, everybody has a purpose except for a few tourists who fight their way through the chaos. You walk on the street here because the sidewalks are packed with goods, street vendors, parked motorcycles, and shops overflowing onto the sidewalk. Crossing a street by obliviously walking into the mass of motorcycles buzzing in every possible direction has become second nature by now, and it amuses me to watch timid tourists waiting for a safe big gap in the flow of traffic that will never happen. There are almost no modern buildings or brand-name stores in the old quarter. Buildings are fairly low, and often dilapidated colonial-era leftovers. Many are haphazard piles of floors, terraces, balconies jutting out, awnings, and roofs, apparently grown organically over the decades. There seems to be no fresh paint in the whole old quarter. At the north end they have a wonderfully rusty old swaying train and motorcycle bridge that passes over a sprawling collection of huts that is best described as a slum, and then over the river. In the evening I splurged on the Metropole's chocolate buffet. It's smaller than the one in the Cairo Nile Hilton, but better quality and it has more variety. 22. Last day, a Tuesday, so some museums that are closed on Mondays are open again. I checked out the Ambassador Pagoda and the Literature Pagoda. The former doesn't have much to offer but the Literature Pagoda is in a very nice garden with two gates, four large lotus ponds, and there are side buildings containing stelae with Chinese inscriptions. You can't take a camera into the Ho Chi Minh mausoleum, you have to check it at the entrance. They have a very long line, but it moves very rapidly. Guards in white uniforms watch as the line enters the mausoleum through the front door, climbs stairs to the room where Ho Chi Minh is on display in a huge open marble casket, and goes out through a side door where you get your camera back. You have only some 30 seconds to see Ho Chi Minh himself. If you pause a guard will grab your arm and usher you on. He looks like a Madame Tussaud's display, with a strong orange light focused on his face. The whole thing is organized so well that it feels like a communist haunted house. Behind the mausoleum is the stilt house where Ho Chi Minh was living for a while, but it looks so spotless that it might as well be a reproduction installed last week. 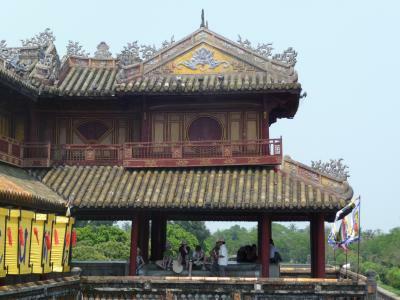 I also went to the Tran Quoc pagoda, by motorcycle. It's on a little island in the West Lake outside the old quarter. It's the oldest pagoda in Hanoi. You can see its tower from a distance - eleven floors, each with a flaring roof and four niches with a white buddha statue facing in four directions, each floor a little smaller than the one below it. It's a very harmonious building. Around it are a number of small shrines, and a prayer hall. After returning to the Metropole and one last dip in the pool, I had to check out. With my bags in storage, I walked about town a little more, but then, for the first time, it began to rain lightly so I returned to the hotel to wait for the airport car I had booked. The light rain turned into a heavy downpour that lasted an hour; most motorcycles vanished from the street and the car threw up sheets of water on both sides. I saw a truck lying on its side. The terminal at the Vietnam Airlines desk was called Cricket08. Cricket08 was down, so it took a long time to process the boarding passes. Then Cricket08 came back up but now its printer jammed. But I was early enough and got my plane. As the sign at the Burmese border said, "Sorry for the slow procedure our computers are slow please be patient". Asia, I'll be back!